This is the sixth book I have read from John Paul Davis, the others being ‘The Templar Agenda’, ‘The Larmenius Inheritance’, ‘The Plantagenet Vendetta’, ‘The Cromwell Deception’ and ‘The Cortés Enigma’. Like his previous books, it is exciting and interesting and hard to put down. The plot describes the actions of an ancient and secret order called the White Hart, set up to defend the realm but to operate in the utmost secrecy. When a group of terrorists attack the official Scottish archives, apparently to steal artwork and manuscripts, the White Hart order get involved because the wife of the Deputy Prime Minister is found to be involved with a member of the group. The terrorists then launch a second attack on the Royal Opera House, Covent Garden, and further links with UK Cabinet Ministers are uncovered. Although they are unable to stop the attack, the White Hart Order find a further attack is planned for a well-known location in Paris. They must then attempt to foil this attack and apprehend the terrorists, as well as finding out more about how the terrorists are linked with members of the UK government, without it becoming public knowledge. I understand that there are further books planned based on the White Hart Order, and the main characters introduced. I look forward to these! I have always enjoyed reading, and since I started using a Kindle some years ago, I have extended my range of authors, often influenced by social media and interactions with the authors themselves. For the last few years, I have mainly read novels from the crime and spy genres, but recently I felt the need to try something new, which might be a bit more emotionally satisfying. In mid-April, Angela and I were travelling to London for a short break and to celebrate our 21st wedding anniversary. 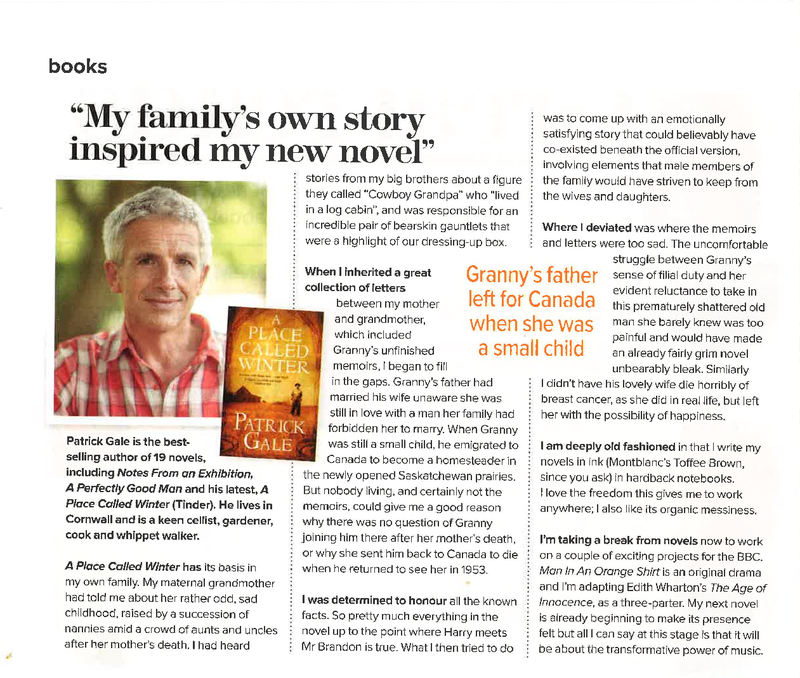 Angela was reading the May issue of ‘Woman and Home’, and showed me an article about an author by the name of Patrick Gale, describing his latest novel (see below). She thought it might be of interest to me, and sure enough I downloaded it. ‘A Place Called Winter’ is based on the author’s family history. It describes how his maternal grandmother’s father emigrated to Saskatchewan, Canada, leaving his wife behind. As a result of this, she had a rather sad childhood, especially when her mother died, leaving her to be brought up by a succession of nannies. Why her father emigrated was unknown to any living relatives, but the author manages to fill in the gaps and create an excellent and totally credible story. I don’t want to say any more, for fear of giving too much away, but I recommend this novel highly. Since reading ‘A Place Called Winter’, I have read two more of Patrick Gale’s novels. ‘Rough Music’ describes events that took place in two family holidays to Cornwall separated by more than 40 years. The story alternates between then and now, and the consequences of what happened all those years ago for present day events are described vividly. I loved this book, and didn’t want it to end! ‘Notes From An Exhibition’ starts with the death of an emotionally troubled artist, and pieces together her life and the effect of her creativity and bouts of depression on her family over a period of some forty years. I enjoyed reading it, but preferred ‘Rough Music’ in that it seemed to reach a slightly more satisfactory conclusion. To conclude, an article in a magazine that I wouldn’t normally read (Woman and Home) introduced me to an new author, and a set of new novels. I’m continuing with these, and I’m going to read ‘A Perfectly Good Man’ next. This is slightly less than last year, but still a reasonable number. James Craig once again published two of his Inspector Carlyle books, and Ruth Rendell appeared twice, as herself and as Barbara Vine. John Paul Davis published three books this year, of which I have read two; the third one will be a 2015 entry. New authors for me in 2014 included Paul Christopher, who has written a series of books on the Templars. Having read the first, I am sure I will be trying the others. I tried a couple of Jodie Picoult books after a magazine recommendation; she has published prolifically and I will no doubt try some more of her books in the future. I also read my first Stephen King novel, Under the Dome, because I wanted to compare it with the TV serialisation (conclusion: there is very little similarity apart from the general theme and some of the main characters). I write book reviews when I can, because I know this helps the authors, but I don’t always have time. And I had a problem with one review I wrote this year when I was criticised for giving too much away (of the plot). It seems to be a fine line between providing enough and too much information! Since writing reviews can be time consuming, this has slightly put me off, but you will find reviews, from me of some of these books on Amazon and Goodreads. To conclude, I enjoy reading when I have time, and interacting with an increasing number of authors on social media helps me to keep up with their latest offerings. I still use a Kindle for most of my reading, although I’m on to my second one because the first developed screen problems and had to be replaced. I’m looking forward to more good reading in 2015.